The creation and implementation of “Proud of My Heritage: An Education and Training Program for the preservation of Grenada’s Heritage” intends to raise awareness in Children and build up the teachers’ capacity about tangible and intangible heritage in Grenada for its recognition and preservation. Proud of My Heritage is a multi-tiered education program designed for students in grades 5 and 6. The focus of the program is to introduce these students to and educate them in the culture of Grenada. They will be exposed to a wide variety of cultural experiences that includes historic buildings, scenic and ecological points of interest, food and many more. Using modern pedagogy, the curriculum will integrate subject matters, engage the students in critical thinking, and move them into the physical environment where their culture has its roots. The purpose for doing this is to codify Grenada culture, teach Grenada culture, and share Grenada culture so that the future generations not only appreciate their past, but are better able to pass it on. Children can learn more about their heritage by having a Proud of my Heritage -Education Curriculum Program at primary schools who will be and become multiplier agents as they have a heritage mindset, spread the word and create more conscious among their family and community. At medium and long term, they will become a new Pro-Heritage generation as they are aware and participate in heritage activities by identifying, promoting, and preserving their own legacy. We believe that building the capacity of local teachers and leveraging education as a force for awareness and transforming heritage into an economic engine that empowers and integrates local people as heritage stewards in this generation and beyond, are the certain ways to preserve the Grenada’s Heritage. Proud of my Heritage can be replicated and integrated into Grenada’s Education Curriculum Program. Intergenerational transmission and interchange of knowledge/skills as children and teachers learn from heritage experts, tradition-bearers and/or elderly people. Transfer of heritage knowledge from elder children to younger generations. Encourages schoolchildren self-responsibility, respect, proud and cooperation for identifying, promoting and preserving their heritage. Encourages the participation of families and neighbours in heritage school activities. Mentoring and networking role of teachers and project’ collaborators. Hands-on which actively encourages schoolchildren and teachers to learn while they are observing, doing research, understanding and experimenting their heritage sites/topics. The Learning Management Web Development is created and implemented as an interactive and useful tool where students, teachers and parent can access to the Heritage Program, including heritage guide and material in printed version. The protection and promotion of cultural heritage was identified as a priority during Meetings of Ministers and Cultural Authorities in recent years. At regional conferences, Members of Caribbean States all express interest in receiving support for the development and preservation of heritage. Heritage Tourism was recommended as a major strategic objective in the current independent consultant report to the Grenada Tourism Authority. The aim of the Grenada National Trust is to map, document, and share with the general public many of the most important historical buildings, landscapes, and memorial places of Grenada. We intend to start the documentation and awareness process by publishing a Grenada Pictorial Coffee Table Book for the benefit of Government Agencies, Embassies, visitors and the general public. Honoring the culture and history of Grenada: many places that played an important role in the history of Grenada and its people are scarcely known or completely unrecorded. The Coffee Table Book will provide an opportunity to raise public awareness about the extent of Grenadian heritage. Encouraging visitation and transmitting knowledge: Visitors, local residents, and especially the younger generation can greatly benefit from a broader picture of the sites and historical landscapes of Grenada. Our legacy is diminished when important places are forgotten. Monitoring and safeguarding: Time and the environment are powerful forces that can degrade and eventually destroy historical sites that are carefully tended. A Pictorial Record will identify the places that should be regularly monitored. Risk Management and Disaster Recovery: Heritage is unique and irreplaceable. Without an accurate listing, photos, and descriptions of our important heritage places, their repair and restoration after a natural or man-made disaster would be impossible. Grenadians commitment is important as you appreciate and support any cause related to create awareness, safeguard and promote our country-roots. 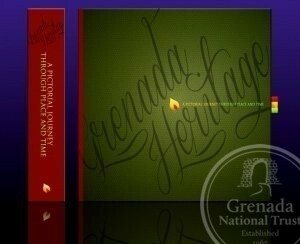 The Grenada Heritage Book can be offered to your relatives and friends as a special gift. As a citizen that is proud of its heritage and a supporter of our country’s development, we are asking your collaboration by purchasing this book that will be available on February 2019. The price per book is USD$ 45. The “Approach to the Protection, Conservation and Nomination of St. George’s Fortified System, Grenada” – 2004 Report was created “to assist, identify and nominate the Grenada’ heritage sites to be included at the UNESCO’s World Heritage Tentative List. The report reveals challenges with regard to Grenada’ heritage sites. One important recommendation was “to come to a balanced National Monuments List by gathering data on the cultural heritage of Grenada for its management and safeguarding”. The Grenada National Trust (GNT) already identified a list of potential monuments/buildings and landscapes that can be documented and assessed but needs to be approved by the Government of Grenada and funded as well (Request for national sites to be considered as National Heritage Landmarks/Monuments, Cabinet Conclusion, Ministry of Tourism, Civil Aviation, Culture and the Performing Arts, October 22nd 2007). In 2012, the National Cultural Policy of Grenada recognized the Cultural Heritage Tourism as among the major income-earners for Grenada but products and services need to be upgraded and expanded. 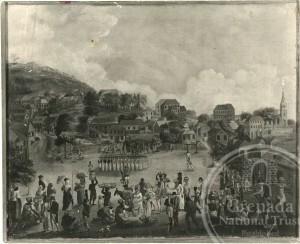 It is stated that the Government of Grenada will give direction to the Division of Culture, in collaboration with the National Trust and Ministry of Tourism,” to carry out an inventory of heritage sites and cultural products that will provide added value to the tourism product…” and encourage them “to develop, and promote, the stories relevant to the Grenadian experience that can bring added value to the tourism product, including those relevant to certain communities” However, there is an urgent need to create and recognize the heritage sites as a first step to adopt and provide a legal framework for the creation of Heritage management, promotion and safeguarding measures in Grenada. The Online National Heritage Sites is the official register which contains over 22 natural and physical heritage sites located at Grenada, Carriacou and Petite Martinique. This register can be used/access by Local Community, Schools, Universities, Researchers, Tour Operators, International Organizations and Government (Physical Planning; Ministry of Tourism, Civil Aviation and Culture; Ministry of Agriculture, Forestry & Fisheries) for Grenada’s Heritage identification, management and preservation. Local community can identify and know where the natural and physical heritage sites are located as a way to create awareness about the management, promotion and preservation of the Grenada’s tangible heritage. The Grenada National Trust is pleased to announce the publication of its first annual calendar. 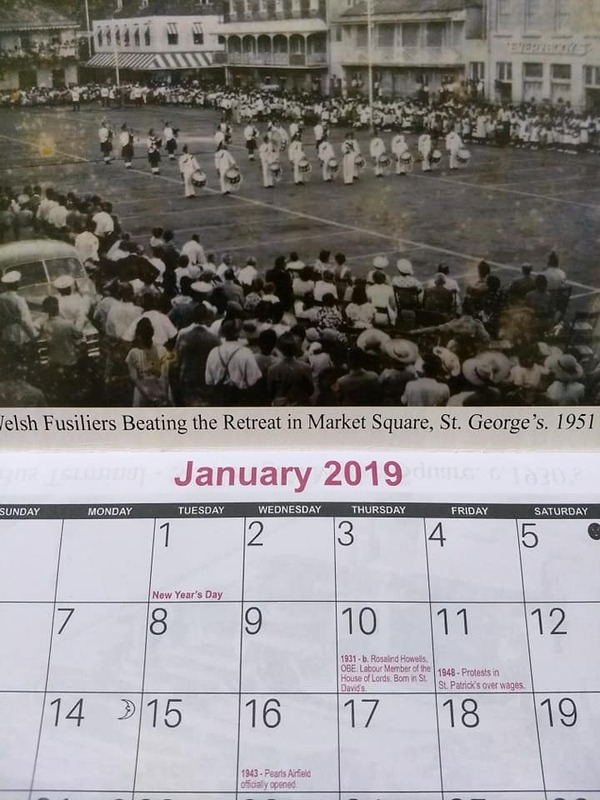 The 2019 Calendar features amazing vintage images of St. George’s, the capital, and also features information specific to the tri-island state such as the births and deaths of notable Grenadians including Uriah “Buzz” Butler and Sir Eric Gairy. Purchasing Grenada Heritage 2019 Calendar – customized version: by adding your company’ information (logo, name, contact, address and phone number): EC17 e/a. Purchasing Grenada Heritage 2019 Calendar – standard version: EC 15 e/a. Note: both versions can be displayed at any shop and/or used as a gift for Christmas (horizontal measures 8.5 by 11 inches). If you would like to purchase the Grenada Heritage – 2019 Calendar, please contact us to confirm your order details. International community recognized Grenada as the Spice of the Caribbean and as a destination with beautiful natural beaches and landscapes but local people and tourists do not know about the Natural and Physical Heritage sites. 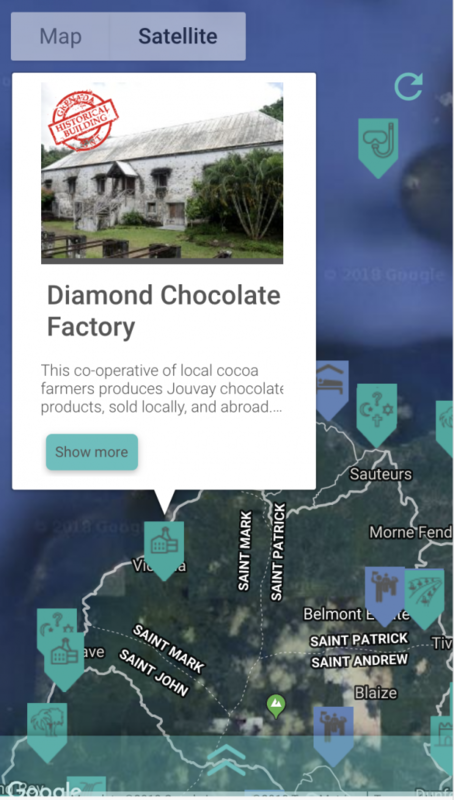 The Grenada National Trust created and launched the Grenada Heritage Map App to recognize and promote physical heritage sites including natural-landscapes and architectural buildings-monuments. This App contains over 50 points of interest with directions by using Google Maps or Apple Maps; its description, photos, operating hours and, contact information. Most important, this App can be downloaded for free at any part of the world, including Grenada’s diaspora, tourists and local people. Currently, GNT has an agreement with Grenada Tourism Authority (GTA) and other stakeholders to create and launch the Grenada GeoTourism Mobile Map as an initiative to promote Grenada’s Heritage sites and Tourism attractions for visitors and residents.